Ethnobotanical Leaflets 14: 781-96. 2010. Leaves and flowers of selected Hibiscus species, used in traditional medicine, were evaluated for antioxidant, antityrosinase and antibacterial activities. Information on these species is meagre and this study would contribute new and additional knowledge on the bioactivities of the genus. Antioxidant properties (AOP) of six species assessed were total phenolic content (TPC), total anthocyanin content (TAC), ascorbic acid equivalent antioxidant capacity (AEAC), ferric reducing power (FRP), ferrous ion chelating (FIC) ability and lipid peroxidation inhibition (LPI) activity. Antityrosinase and antibacterial activities of four species were assessed using the modified dopachrome and disc diffusion methods, respectively. Leaves and flowers of Hibiscus tiliaceus showed outstanding AOP. Leaves of species with high TPC and AEAC had low FIC ability and vice versa. Red flowers which yielded the highest TAC also displayed high FIC ability and LPI activity. Leaves of H. tiliaceus had the strongest antityrosinase (AT) activity. With very strong AOP and AT activity, leaves of H. tiliaceus have potentials to be developed into functional food and skin care products. At 1 mg extract/disc, leaves of Hibiscus sabdariffa were found to inhibit Gram-positive bacteria of Bacillus cereus, Micrococcus luteus and Staphylococcus aureus.� At 2 mg extract/disc, leaves of H. sabdariffa inhibited both Gram-positive and Gram-negative bacteria of Escherichia coli, Pseudomonas aeruginosa and Salmonella choleraesuis. This is the first report of leaf extracts of H. sabdariffa inhibiting Gram-negative bacteria. Adding 1 mM of ethylenediamine tetraacetic acid (EDTA) to the agar slightly enhanced the antibacterial activity of leaves of H. sabdariffa on Gram-negative bacteria. With a wide spectrum of inhibition against Gram-positive and Gram-negative bacteria, leaves of H. sabdariffa are worthy of further investigation as a natural wide spectrum antibacterial agent. Keywords: Hibiscus, antioxidant, antityrosinase, antibacterial, leaves, flowers. The genus Hibiscus (Malvaceae) comprises about 275 species in the tropics and sub-tropics (Dasuki, 2001). Within the Malesian region, 43 species are found. Most Hibiscus species have a remarkable colour pattern with the base of corolla forming a deep-coloured heart (Lowry, 1976). Another feature is flower colour change among species of which the most spectacular is in flowers of Hibiscus mutabilis L. Leaves of Hibiscus are simple, lobed, alternate or spiral and have paired stipules (Ng, 2006). Flowers are radially symmetrical with cup-shaped calyx, five petals joined at the base, style bearing many stamens and stigma with five hairy lobes. Leaves and flowers of selected Hibiscus species are used in traditional medicine. Information on their antioxidant, antityrosinase and antibacterial activities is meagre. This study would contribute new and additional knowledge on the bioactivities of the genus. Hibiscus species studied were H. mutabilis, H. rosa-sinensis, H. sabdariffa, Hibiscus schizopetalus (Dyer) Hook. f., H. taiwanensis and H. tiliaceus (Fig. 1). Voucher specimens of species studied were deposited in the herbarium of Monash University Sunway Campus in Malaysia. Leaves and flowers for screening were collected a day before extraction and kept fresh in sealed plastic bags in a refrigerator. From each location, three individual plants per species were sampled. Fig. 1. Hibiscus species studied. For analysis of bioactivities, plant materials (1 g) of fresh leaves and petals were powdered with liquid nitrogen in a mortar and extracted using methanol (50 ml), with continuous swirling for 1 h at room temperature with an orbital shaker. Extracts were filtered under suction and stored at -20�C for further use. Antioxidant properties assessed were total phenolic content, total anthocyanin content, radical scavenging activity, ferric reducing power, ferrous ion chelating ability and lipid peroxidation inhibition activity. Total anthocyanin content (TAC) was determined by the pH differential method (Teow et al., 2007). Potassium chloride solution (2 ml, 1 M and pH 1.0) was added to 1 ml of extract in triplicate. Measurements were blanked against sodium acetate buffer (2 ml, 1 M and pH 4.5) with the same amount of extract. Absorbance was measured at 520 nm and 700 nm. TAC was expressed as cyanidin-3-glucoside equivalent (CGE) in mg per 100 g of sample. The molar extinction coefficient of cyanidin-3-glucoside was 26 900. Radical scavenging activity was determined using the 2,2-diphenyl-1-picrylhydrazyl (DPPH) assay (Miliauskas et al., 2004). Different dilutions of extract (1 ml) were added to 2 ml of DPPH (5.9 mg/100 ml methanol). Absorbance was measured at 517 nm after 30 min. Radical-scavenging was calculated as IC50 and expressed as ascorbic acid equivalent antioxidant capacity (AEAC) in mg AA/100 g = IC50(ascorbate)/IC50(sample) x 105. The IC50 of ascorbic acid used for calculation of AEAC was 0.00387 mg/ml. Ferric reducing power (FRP) was assessed using the potassium ferricyanide assay (Chu et al., 2000). Different dilutions of extract (1 ml) were added to 2.5 ml phosphate buffer (0.2 M and pH 6.6) and 2.5 ml of potassium ferricyanide (1% w/v). The mixture was incubated at 50 oC for 20 min. Trichloroacetic acid solution (2.5 ml and 10% w/v) was added to stop the reaction. The mixture was then separated into aliquots of 2.5 ml and diluted with 2.5 ml of water. To each diluted aliquot, 0.5 ml of ferric chloride solution (0.1% w/v) was added. After 30 min, absorbance was measured at 700 nm. FRP was expressed as mg GAE/g. The calibration equation for gallic acid was y = 16.767x (R2 = 0.9974), where y is absorbance and x is concentration of gallic acid in mg/ml. Ferrous ion chelating (FIC) ability was assessed using the ferrous-ferrozine assay (Singh and Rajini, 2004). Solutions of 2 mM FeSO4 and 5 mM ferrozine were diluted 20 times. FeSO4 (1 ml) was mixed with different dilutions of extract (1 ml), followed by ferrozine (1 ml). Absorbance (A) was measured at 562 nm after 10 min. Chelating ability = (1 � Asample/Acontrol) x 100%. Lipid peroxidation inhibition (LPI) activity was determined using the -carotene bleaching assay (Kumazawa et al., 2002). Emulsion of -carotene and linoleic acid was prepared by adding 3 ml of -carotene (5 mg in 50 ml chloroform) to 40 mg of linoleic acid and 400 mg of Tween 40. Chloroform was evaporated under vacuum and oxygenated ultra-pure water (100 ml) was added and mixed well. Initial absorbance (A) of the emulsion was measured at 470 nm. Aliquots of the emulsion (3 ml) were mixed with 10, 50 and 100 ml of extracts and incubated in a water bath at 50 �C for 1 h. Bleaching rate of -carotene was measured at 470 and 700 nm. Measurement at 700 nm was needed to correct for the presence of haze. LPI expressed as antioxidant activity (AOA) was calculated as bleaching rate (BR) of -carotene = ln(Ainitial/Asample)/60 and AOA = (1 - BR.sample/BRcontrol) x 100% where Ainitial and Asample are absorbance of the emulsion before and 1 h after incubation, and BRsample and BRcontrol� are bleaching rates of the sample and negative control, respectively. Antityrosinase (AT) activity was determined using the modified dopachrome method with L-3,4-dihydroxyphenylalanine (L-DOPA) as substrate (Masuda et al., 2005). Assays were conducted in a 96-well microtitre plate and a plate reader was used to measure absorbance at 475 nm with 700 nm as reference. Samples were dissolved in 50% dimethylsulphoxide (DMSO). Each well contained 40 �l of sample with 80 �l of phosphate buer (0.1 M, pH 6.8), 40 �l of tyrosinase (31 units/ml) and 40 �l of L-DOPA (2.5 mM). Each sample was accompanied by a blank that had all the components except L-DOPA. Results were compared with a control consisting of 50% DMSO in place of sample. AT activity was calculated as (Acontrol - Asample)/Acontrol x 100%. Leaves of Psidium guajava L. (Guava) were used as positive control as they have very high AT activity (Vimala et al., 2006). The disc diusion method (Chung et al., 2004) was used to screen for antibacterial activity of leaf extracts. Agar cultures of Gram-positive bacteria of Bacillus cereus, Micrococcus luteus and Staphylococcus aureus, and Gram-negative bacteria of Escherichia coli, Pseudomonas aeruginosa and Salmonella choleraesuis were prepared. Suspensions of bacteria (100 �l) were spread evenly onto 20 ml Mueller-Hinton agar preset in 90 mm Petri dishes. Paper discs (6 mm diameter) were impregnated with 1 mg of extract dissolved in 100 �l solvent, and transferred onto the inoculated agar. Streptomycin susceptibility discs (10 �g) and methanol impregnated disc were used as positive and negative controls, respectively. After incubation overnight at 37 oC, inhibition zones were measured and recorded as mean diameter (mm). Antibacterial activity was also expressed as inhibition percentage of streptomycin and arbitrarily classified as strong for inhibition of 70%, moderate for inhibition 50 < 70%, and weak for inhibition < 50% (Chan et al., 2007). Leaves of H. mutabilis (Confederate rose) are broadly ovate with mostly five triangular lobes. Flowers are white in the morning, turning pink in the afternoon, and red in the evening. Leaves H.� rosa-sinensis (China rose) are ovate with serrated margins.� Flowers are red with a long and slender style, anthers yellow and stigma red. Leaves of H. sabdariffa (Roselle) are broadly ovate with 3-5 lobes and stems are reddish. Flowers open pinkish in the morning, turning orange in the evening. Leaves of H. schizopetalus (Coral hibiscus) resemble those of H. rosa-sinensis. Flowers are red, pendulous with a long extended style and petals are finely dissected. Leaves of H. taiwanensis (Cream hibiscus) are finely toothed and flowers are yellow with a prominent deep brown eye. Leaves of H. tiliaceus (Sea hibiscus) are heart-shaped, and flowers are bell-shaped with maroon-coloured heart and stigma. Flowers are yellow in the morning, turning orange-red in the evening. Leaves of H. tiliaceus showed outstanding antioxidant properties (AOP) with TPC and AEAC values of 2080 mg GAE/100 g and 2370 mg AA/100 g, respectively (Table 1). Values were 2.4 and 2.7 times higher than those of H. mutabilis which ranked second. Based on TPC and AEAC, ranking was: H. tiliaceus > H. mutabilis > H. sabdariffa > H. taiwanensis > H. schizopetalus ~ H. rosa-sinensis. Leaves of H. schizopetalus, H. sabdariffa and H. rosa-sinensis had better FIC ability than those of H. mutabilis, H. tiliaceus and H. taiwanensis (Fig. 2). Leaves of species with higher TPC and AEAC had lower FIC ability for H. tiliaceus and H. mutabilis, and vice versa for H. schizopetalus and H. rosa-sinensis. This suggests the presence of compounds in leaves of H. schizopetalus and H. rosa-sinensis with relatively weak radical scavenging activity but good metal chelating ability that could prevent the generation of hydroxyl radicals via Fenton�s reaction. Values of TPC, TAC, AEAC and FRP are means � SD (n = 3). For each column, values followed by the same letter (a-f) are not statistically different at P < 0.05 as measured by the Tukey HSD test. For each species, samples were collected from the same location. Abbreviations: GAE = gallic acid equivalent, AA = ascorbic acid and CGE = cyanidin-3-glucoside equivalent. Of the six Hibiscus species, leaves and flowers of H. tiliaceus had the strongest AOP. A likely explanation is that H. tiliaceus is the only indigenous tree species while the other species are exotic shrubs and herbs. Being long-lived, trees have to produce a wide range of chemical defenses against herbivores and infections. Higher antioxidant activity of trees than shrubs and herbs has been reported (McCune and Johns, 2007). 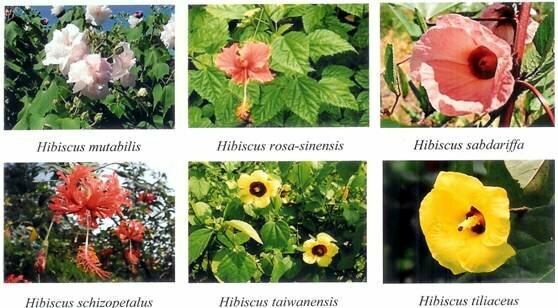 Based on AOP of leaves and flowers, the six Hibiscus species can be divided into three categories (Wong et al., 2009). They are species with comparable values in leaves and flowers (H. tiliaceus), species with significantly higher values in leaves than flowers (H. mutabilis and H. sabdariffa), and species with significantly higher values in flowers than leaves (H. taiwanensis, H. rosa-sinensis and H. schizopetalus). Of four species of Hibiscus tested, leaves of H. tiliaceus (42%) had the strongest AT activity (Table 3). Values were comparable to leaves of P. guajava (41%) as positive control. Ranking of AT activity was: H. tiliaceus > H. mutabilis > H. rosa-sinensis ~ H. sabdariffa. Leaves of H. tiliaceus displayed the highest tyrosinase inhibition among 39 tropical plant species screened by Masuda et al. (2005). At 1 mg extract/disc, leaves of H. tiliaceus and H. sabdariffa were found to inhibit Gram-positive bacteria of M. luteus, S. aureus and B. cereus (Table 4). Leaves of H. tiliaceus exhibited moderate antibacterial activity against all three Gram-positive bacteria. Leaves of H. sabdariffa weakly inhibited M. luteus and B. cereus. Mean diameter zone of inhibition of streptomycin was 20 mm for M.� luteus, 18 mm for S. aureus and 18 mm for B. cereus. Leaves of all four Hibiscus species showed no antibacterial activity on Gram-negative bacteria of P. aeruginosa, S. choleraesuis and E. coli. Values of AT activity are means � SD (n = 3). Values followed by the same letter (a-c) are not statistically different at P < 0.05 as measured by the Tukey HSD test. Concentration of extracts used was 0.5 mg/ml. Leaves of P. guajava were used as positive control. Chung et al. (2004) reported that none of 191 plant extracts from 30 families inhibited Gram-negative bacteria. Similarly, screening of extracts of 26 edible plant species by Alzoreky and Nakahara (2003) showed that Gram-negative bacteria were not susceptible to plant extracts. Screening of five different extracts from five ethnomedicinal plant species also showed that most of the antibacterial activity detected was against Gram-positive bacteria (Murugan et al., 2008). Gram-negative bacteria are generally less susceptible to plant extracts than Gram-positive bacteria due to their outer membrane of lipopolysaccharide and lipoprotein, which is resistant towards antibacterial substances (Chopra and Greenwood, 2001; Alzoreky and Nakahara, 2003). For Gram-positive bacteria, MID of leaf extracts of H. sabdariffa was 1 mg/disc for M. luteus and B. cereus, and 2 mg/disc for S. aureus (Table 5). MID of leaf extracts of H. tiliaceus was 0.5 mg/disc for M. luteus, 0.25 mg/disc for S. aureus and 1 mg/disc for B. cereus. Screening for antibacterial activity of plant extracts is normally done using the disc diffusion method at concentration of 1 mg extract/disc. By increasing the concentration to 2 mg extract/disc, leaves of H. sabdariffa displayed moderate inhibition on all six Gram-positive and Gram-negative bacteria (Table 6). Gram-negative bacteria were not inhibited at 1 mg extract/disc. Results indicated that phenolic compounds in leaves of H. sabdariffa might be bactericidal and the mode of action might be dose dependent. At 2 mg extract/disc, antibacterial activity of leaves of H. tiliaceus remained the same as 1 mg extract/disc. Inhibition was moderate on S. aureus, and weak on M. luteus and B. cereus with no inhibition on the three Gram-negative bacteria. Results indicated that the inhibitive properties of phenolic compounds in leaves of H. tiliaceus might be non-dose dependent. This is the first report of leaf extracts of H. sabdariffa inhibiting Gram-negative bacteria of P. aeruginosa, S. choleraesuis and E. coli. None of plant extracts from 50 species reported by Wiart et al. (2004) inhibited E. coli. With a wide spectrum of inhibition against Gram-positive and Gram-negative bacteria, leaves of H. sabdariffa are worthy of further investigation as a natural� wide spectrum antibacterial agent. Similar wide spectrum of antibacterial activity has been reported in extracts of Andrographis paniculata (Burm. F.) Nees (Sule et al., 2010). Adding 1 mM of EDTA to the agar slightly enhanced the antibacterial activity of leaves of H. sabdariffa on Gram-negative bacteria (Table 7). At 2 mg/disc, extracts of H. sabdariffa moderately inhibited E. coli and weakly inhibited P. aeruginosa. At 1 mg/disc, leaves of H. sabdariffa weakly inhibited P. aeruginosa which showed no inhibition without EDTA. Leaves of H. tiliaceus showed no activity on Gram-negative bacteria at extract concentrations of 1 and 2 mg/disc. This study also yielded other interesting results. EDTA adversely affected the bactericidal activity of streptomycin. With S. choleraesuis, the antibiotic showed no zones of inhibition. In the absence of EDTA, the antibiotic yielded zones of inhibition of 13 mm. With P. aeruginosa, EDTA enhanced the bactericidal effect of streptomycin as the zone of inhibition was enlarged to 22 mm compared to 14 mm without EDTA. Haque and Russell (1974) have reported that EDTA can permeabilise the outer membrane of P. aeruginosa, making the bacteria susceptible to antibiotics and certain antiseptic agents. Sensitivity of Gram-negative bacteria to antibacterial agents is mainly attributed to increasing permeability of the outer membrane and releasing endogenous phospholipases degrading membrane lipids (Alzoreky and Nakahara, 2003). In this study, adding 1 mM of EDTA to the agar rendered streptomycin ineffective against S. choleraesuis but enhanced the efficiency of the antibiotic against P. aeruginosa. This observation has not been reported before. Alzoreky and Nakahara (2003) had reported that EDTA inhibited the growth of B. cereus while S. aureus grew prolifically. Based on inhibition percentages compared to streptomycin, antibacterial activity is categorized as moderate ++ for inhibition 50 < 70%, or weak + for inhibition < 50%. Of six Hibiscus species screened, leaves and flowers of H. tiliaceus showed outstanding AOP. Leaves of species with high TPC, AEAC and FRP had low FIC ability.� Red flowers with high TAC is positively correlated with FIC ability and LPI activity. Based on AOP of leaves and flowers, the six species screened can be categorized into species with comparable values in leaves and flowers, species with significantly higher values in leaves than flowers, and species with significantly higher values in flowers than leaves. Of four species of Hibiscus tested, leaves of H. tiliaceus had the strongest AT activity. With strong AOP and AT activity, leaves of H. tiliaceus have potentials to be developed into functional food and skin care products. At 1 mg extract/disc, leaves of H. sabdariffa were found to inhibit Gram-positive bacteria of M. luteus, S. aureus and B. cereus but not Gram-negative bacteria of P.� aeruginosa, E. coli and S. choleraesuis. �At 2 mg extract/disc, leaves displayed inhibition on all six Gram-positive and Gram-negative bacteria. Adding 1 mM of EDTA to the agar slightly enhanced the antibacterial activity of leaves against Gram-negative bacteria. This is the first report of leaf extracts of H. sabdariffa inhibiting Gram-negative bacteria. With a wide spectrum of inhibition against both Gram-positive and Gram-negative bacteria, leaves of H. sabdariffa are worthy of further investigation as a natural wide spectrum antibacterial agent. The authors are thankful to Monash University Sunway Campus and UCSI University in Malaysia for supporting this study and to Dr. H.T. Chan for identifying and locating the species studied. Chan, E.W.C., Lim, Y.Y. and Omar, M. 2007. Antioxidant and antibacterial activity of leaves of Etlingera species (Zingiberaceae) in Peninsular Malaysia. Food Chemistry 104: 1586-1593. Chopra, I. and Greenwood, D. 2001. Antibacterial agents: basis of action. In: Encyclopedia of Life Sciences. Nature Publishing Group, John Wiley and Sons, Limited. Chu, Y.H., Chang, C.L. and Hsu, H.F. 2000. Flavonoid content of several vegetables and their antioxidant activity. Journal of the Science of Food and Agriculture 80: 561-566. Chung, P.Y., Chung, L.Y., Ngeow, Y.F., Goh, S.H. and Imiyabir, Z. 2004. Antimicrobial activities of Malaysian plant species. Pharmaceutical Biology 42: 292-300. Dasuki, U.A. 2001. Hibiscus. In van Valkenburg, J.L.C.H. and Bunyapraphatsara, N. (eds.). Plant Resources of South-East Asia No. 12(2): Medicinal and Poisonous Plants 2., pp. 297-303. Backhuys Publisher, Leiden, Netherlands. G�lcin, I., Berashvili, D. and Gepdiremen, A. 2005. Antiradical and antioxidant activity of total anthocyanins from Perilla pankinensis Decne. Journal of Ethnopharmacology 101: 287-293. Haque, H. and Russell, A.D. 1974. Effect of chelating agents on the susceptibility of some strains of Gram-negative bacteria to some antibacterial agents. Antimicrobial Agents and Chemotherapy 6: 200-206. K�hk�nen, M.P., Hopia, A.I., Vuorela, H.J., Rauha, J.P., Pihlaja, K., Kujala, T.S. and Heinonen, M. 1999. Antioxidant activity of plant extracts containing phenolic compounds. Journal of Agricultural and Food Chemistry 47: 3954-3962. Kumazawa, S., Taniguchi, M., Suzuki, Y., Shimura, M., Kwon, M.S. and Nakayama, T. 2002. Antioxidant activity of polyphenols in carob pods. Journal of Agricultural and Food Chemistry 50, 373-377. Lowry, J.B. 1976. Floral anthocyanins of some Malesian Hibiscus species. Phytochemistry 15: 1395-1396. Masuda, T., Yamashita, D., Takeda, Y. and Yonemori, S. 2005. Screening for tyrosinase inhibitors among extracts of seashore plants and identification of potent inhibitors from Garcinia subelliptica. Bioscience, Biotechnology and Biochemistry 69: 197-201. Mackeen, M.M., Ali, A.M., Lajis, H.H., Kawazu, K., Hassan, Z., Amran, M., Habsah, M., Mooi, L.Y. and Mohamed, S.M. 2000. Antimicrobial, antioxidant, antitumour-promoting and cytotoxic activities of different plant part extracts of Garcinia atroviridis. Journal of Ethnopharmacology 72: 395-402. McCune, L.M. and Johns, T. 2007. Antioxidant activity relates to plant part, life form and growing condition in some diabetes remedies. Journal of Ethnopharmacology 112: 461-469. Miliauskas, G., Venskutonis, P.R. and van Beek, T.A. 2004. Screening of radical scavenging activity of some medicinal and aromatic plant extracts. Food Chemistry 85: 231-237. Murugan, P., Rajesh, A., Athiperumalsami, T. and Mohan, V.R. 2008. Screening of certain ethnomedicinal plants for antibacterial activity. Ethnobotanical Leaflets 12: 433-438. Noda, Y., Kneyuki, T., Igarashi, K., Mori, A. and Packer, L. 2000. Antioxidant activity of nasunin, an anthocyanin in eggplant peels. Toxicology 148: 119-123. Rosa, R.M., Melecchi, M.I., da Costa Halmenschlager, R., Abad, F.C., Simoni, C.R., Caram�o, E.B., Henriques, J.A., Saffi, J. and de Paula Ramos, A.L. 2006. Antioxidant and antimutagenic properties of Hibiscus tiliaceus L. methanolic extract. Journal of Agricultural and Food Chemistry 54: 7324-7330. Singh, N. and Rajini, P.S. 2004. Free radical scavenging activity of an aqueous extract of potato peel. Food Chemistry 85: 611-616. Sule, A., Ahmed, Q.U., Samah, O.A. and Omar, M.N. 2010. Screening for antibacterial activity of Andrographis paniculata used in Malaysian folkloric medicine: a possible alternative for the treatment of skin infections. Ethnobotanical Leaflets 14: 445-456. Teow, C.C., Truong, V.D., Mcfeeters, R.F., Thompson, R.L., Pecota, K.V. and Yencho, G.C. 2007. Antioxidant activities, phenolic and -carotene contents of sweet potato genotypes with varying flesh colours. Food Chemistry 103: 829-838. Vimala, S., Ilham, M.A., Rashih, A.A., Rohana, S. and Juliza, M. 2006. Antioxidant and skin whitening standardized extracts: cosmeceutical and neutraceutical products development and commercialization in FRIM. In Zanariah, N. et al. (eds.) Highlights of FRIM's IRPA Projects 2005: Identifying Potential Commercial Collaborations. Forest Research Institute Malaysia. Wiart, C., Mogana, S., Khalifah, S., Mahan, M., Ismail, S., Buckle, M., Narayana, A.K. and Sulaiman, M. 2004. Antimicrobial screening of plants used for traditional medicine in the state of Perak, Peninsular Malaysia. Fitoterapia 75: 68-73. Wong, S.K. 2008. Bioactivity Studies of Leaves and Flowers of some Hibiscus Species. B.Sc. (Biotechnology) Honours Thesis, Monash University Sunway Campus, Malaysia. Wong, S.K., Lim, Y.Y. and Chan, E.W.C. 2009. Antioxidant properties of Hibiscus: species variation, altitudinal change, coastal influence and floral colour change. Journal of Tropical Forest Science 21: 307-315. Wu, P.L., Wu, T.S., He, C.X., Su, C.H. and Lee, K.H. 2005. Constituents from the stems of Hibiscus taiwanensis. Chemical and Pharmaceutical Bulletin 53: 56-59.